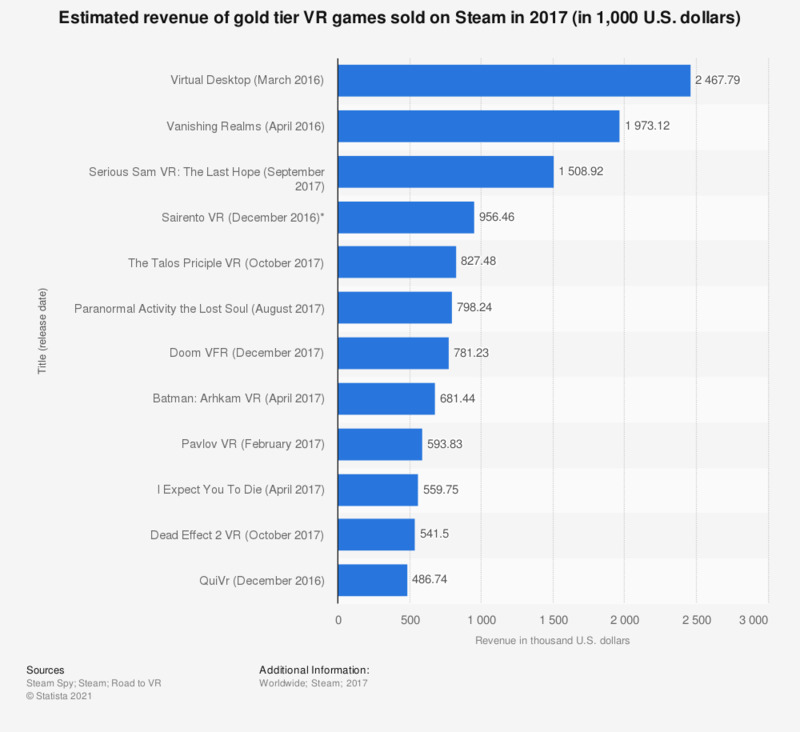 This statistic presents the estimated revenue of gold tier VR games sold on Steam in 2017. According to the findings, Virtual Desktop had the largest estimated revenue in the measured period, with a result of 2.46 million U.S. dollars. Vanishing Realms ranked second in this tier, with a 1.97 million revenue. The source provided the following information on the methodology: "Here’s a look at the Gold and Platinum tiers; in an effort to roughly estimate the range of revenues within each tier we’ve estimated total gross revenue (not just 2017) based on data from SteamSpy (assuming MSRP for all sales), and sorted each tier by that figure. It’s also worth noting that some of these titles (like Fallout 4 VR and Tilt Brush) are or were bundled at one time with sales of the HTC Vive, a confounding variable in the total gross estimation."